Brunching at my brother and sister-in-law’s yesterday, we wanted to surprise them with a fun host treat. Noticing a sign at a nearby café that caught our eye, we were all about it, as it advertised Stumptown cold brew coffee. Dan and I have been getting into this lately, as we’ve been trying various cold brews from around the area (more on that soon). So we walked into Café 1 of a Kind – yes, strangely that’s its name – to check it out. Situated on Northern Blvd in Little Neck, Café 1 of a Kind sits right next to other food establishments such as La Baraka French Café and Red Lotus Chinese bakery, which is one of my favorites. Unlike its neighbors, Café 1 of a Kind boasts an ultra modern façade and a sleek, contemporary interior. I liked it from the minute we walked in, as the furnishings are earthy with a hint of rusticity. You’ll find dark wood paneling, a few welcome bursts of green and fun light fixtures that have a whimsy feel. It’s great to see they have free wifi and lots of communal tables to sit with a larger group or even smaller tables if you want more privacy. I can see this as a good place to spend time and do work, blog, or have a meeting. 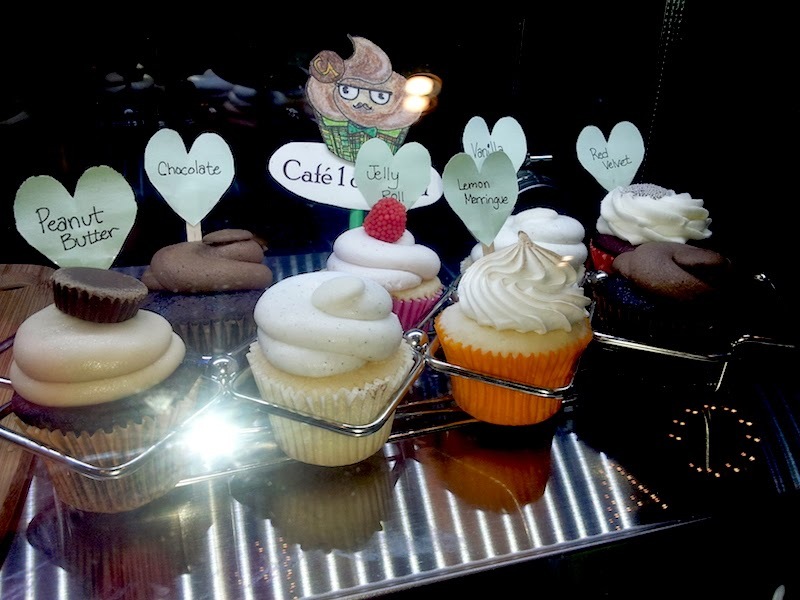 Although we came here for the Stumptown, we walked out with something else – cupcakes to be exact. Noticing a lovely display of baked goods and various savory things, we quickly chose a treat to bring over for brunch. Sweet Street Cupcakes – Given that I’m a cupcake freak, I immediately stopped to marvel at these beauties, which came in a few different flavors including chocolate, peanut butter/chocolate, vanilla bean, red velvet and lemon meringue. Supplied by Sweet Street Bakery in Pennsylvania, which started out as a small batch producer, I knew I wanted to try a few flavors including the chocolate ganache, chocolate/peanut butter, lemon meringue and jelly roll. We cut the cupcakes carefully in order to try them all and quickly devoured them. While they were all delicious, my favorite was the lemon meringue, which came with a light, fluffy dollop of frosting (or meringue to be exact). The inside was lovely too, as it was soft, airy and injected with a shot of lemon curd. Agreeing that the chocolate cupcake was a close second (or first for some), we enjoyed its unbelievably rich frosting and perfectly moist chocolate cake. Stumptown Coffee – Although I found the cold brew to be expensive ($5 a bottle) and didn’t end up purchasing it, I did however go with the hot drip coffee and it was awesome. Rich, earthy and potent, you didn’t need to mix it with too much milk and a little went a long way. If you’re a Stumptown fan like me, you’ll be happy to know that they sell 1 lb bags that you can grind and brew at home. 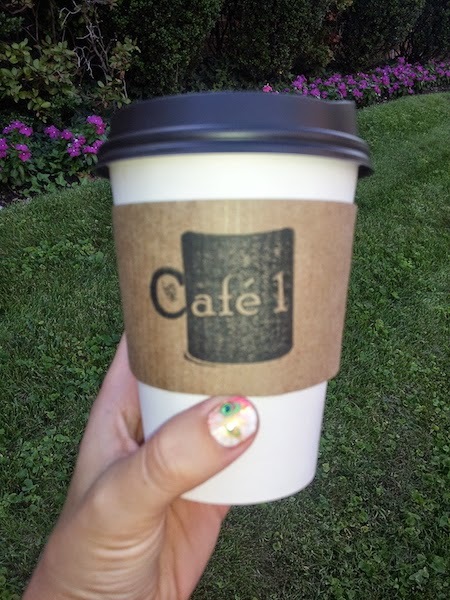 Because this place is brand new, and also to give credit to its lovely staff, Café 1 of a Kind’s service was on point. Even though at times I found the baristas a little slow, it’s only because they were trying their very best to please each customer, including going downstairs and fetching the cupcakes of my choice. Everyone was simply lovely, and I’m eager to come back. Costs are on the higher side for coffee, but reasonable comparatively speaking for desserts. Given the high quality of everything they sell, I think the costs are fairly justified.